This picture is a representation of the essence of my approach. It is a highly customisable blend of ‘Being’, ‘Doing’ and Relating’ that is tailored to each leader’s or organisation’s circumstances. Below are the principles that guide how I partner with client organisations. My focus is on people staying connected to one another through change. This is because it is people who bring results, and people who measure them. Therefore the design of leadership conversations is critical and a key part of my partnering stance. 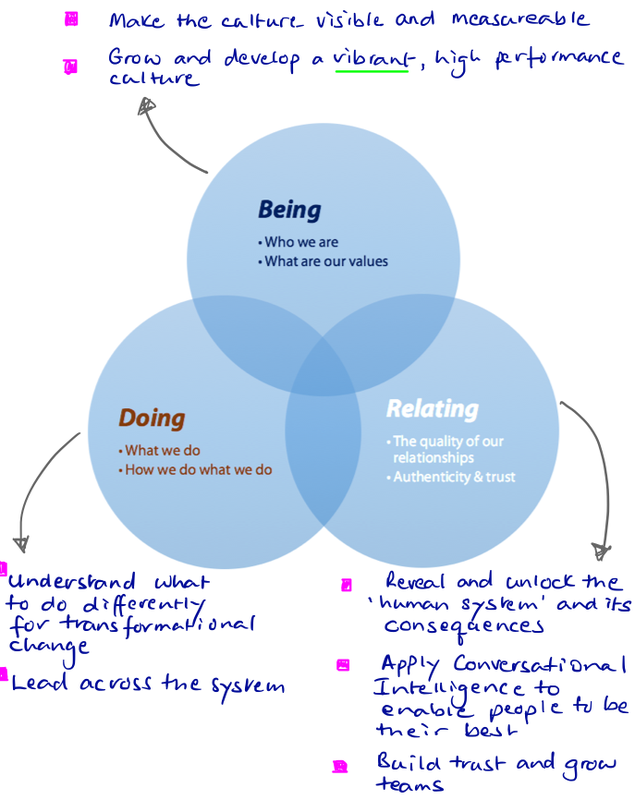 Alongside an understanding of systemic forces that shape behaviour in organisations – the human system – I bring an understanding of systems thinking, or ‘how the work works’. This brings together leadership with grass roots engagement and accountability. Asking the right questions, from the principles above, will help people come together in conversations that actually enhance engagement and enable change.